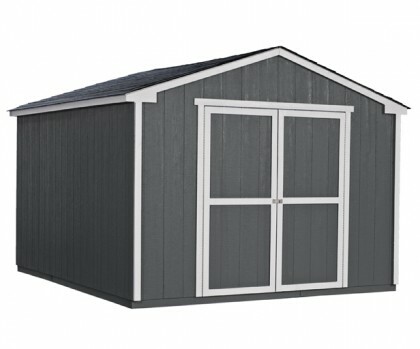 This 10’x12’ shed is designed to support your lifestyle. Whether that’s freeing up garage space to make room for your garage band or converting it into a backyard sanctuary… Extra-wide 64” double doors make it easy to get motorcycles, ATV’s, tractors and bicycles in and out. 6’ tall side walls give you plenty of vertical storage space so you can reserve floor space for other things that you love. Checking off the honey-to-do list can be a challenge, but this shed is ready to help you get things done. Your local building authority may have specific requirements resulting in additional cost. Prices do not include painting, staining, permits, zoning and setback advice and/or compliance, excavation, or leveling beyond 6". All prices and content are subject to change without notice. Promotions are valid with online transactions only and cannot be used in conjunction with promotions at a servicing sales/distribution center or distribution center. Not valid on prior purchases. All stated sizes are nominal dimensions and approximate. Some buildings may be shown with optional items. Additional mileage charges (if applicable) and taxes will be calculated after checkout process is completed. Painted 10x12 storage shed is a representation only, arrives primed for painting in a light beige color.